That’s how many lives on average are lost to suicide in the United States each day, according to the American Foundation for Suicide Prevention. MU student Zach Lahr and members of the Mizzou Student Suicide Prevention Coalition (MSSPC) are working to prevent that statistic from claiming lives on campus. From left: Zach Lahr, Kendall MacDonald, Kelly Weber, Tess Rusbarsky, and Kenna Hughes, all members of Mizzou Student Suicide Prevention Coalition, pose for a photo at the 2017 Out of Darkness Walk in Columbia. Lahr, a senior from Lindenhurst, Illinois, studying human development and family science, says his primary goal as president of MSSPC is to improve inclusion within the organization and strengthen partnerships across campus. MSSPC was founded about four years ago by a group of students who lost their friend to suicide. Their goal was to raise awareness of mental health and suicide to help prevent other students from feeling isolated and potentially dying by suicide. “We want to create a community here at Mizzou that supports mental health, mental illness, suicide prevention and the various intersections these issues bring about,” he said. Suicide was the second leading cause of death in 2016 for individuals ages 15 to 24, according to the Centers for Disease Control and Prevention. Suicide claimed approximately 5,723 lives that year. Lahr said being a part of the organization has given him a supportive environment on campus. “MSSPC continues to be a beacon of hope within my life. It reinforced the idea that it is OK to not be all right,” he said. Students and individuals concerned about an MU student can call 573-882-6601 to speak to a counselor 24/7. It can also be difficult to watch a friend face a challenge and not know how to help them. The online University of Missouri suicide prevention training program, helps prepare students, faculty and staff to recognize and respond to individuals who might be suicidal. Lahr encourages students to connect friends in need of support to mental health professionals on campus and within the community. MU student fees cover several appointments at the Counseling Center and Student Health Center. Counselors are trained to provide mental health services in a brief therapy model. Most importantly, if someone approaches you for support, listen to them. The National Suicide Prevention Lifeline is available at 1-800-273-8255. Text “Home” to 741741 to be connected to the Crisis Text Line. Visit wellbeing.missouri.edu to learn more. 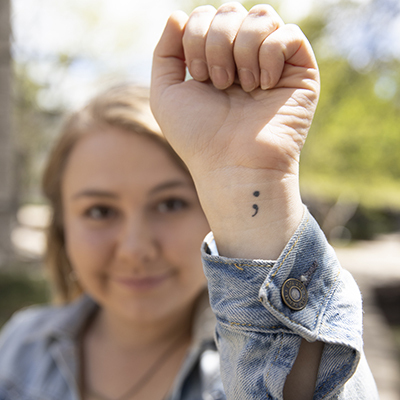 Individuals around the world have semicolon tattoos, representing their own experiences with mental illness or their support for others.